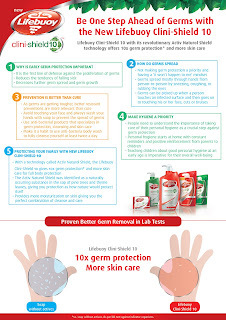 As all of us know that the emergence of "Super-Germs" is becoming a global concern coz' it had spread these bacteria which results in unforeseen illness especially to our little ones who do not have access to proper means of hygiene. 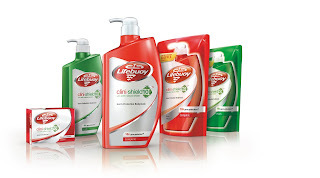 In recognition of this, Lifebuoy with its revolutionary Activ Natural Shield technology is introducing Clini-Shield 10. This newly launched anti-bacterial body wash provides 10x germ protection and more skin care for full body protection which is good for me and my Little Angels. Germs are getting stronger. 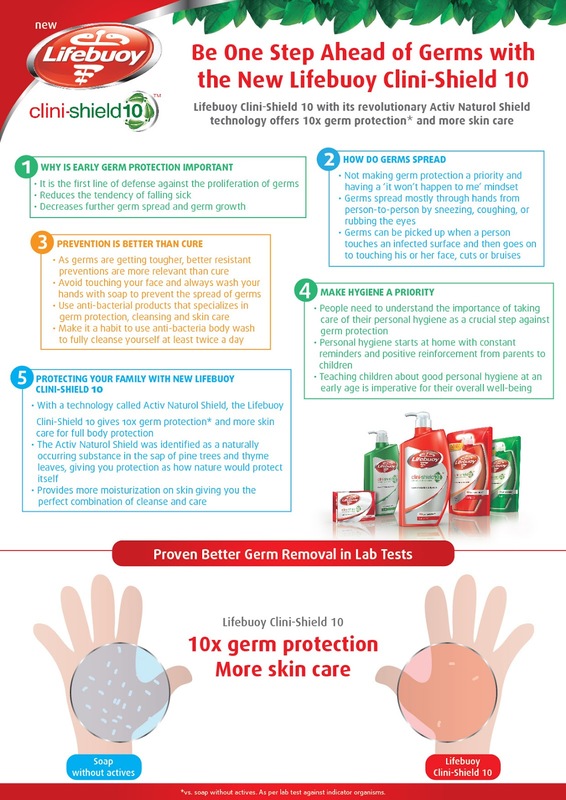 Thats why it is important for us to practise good hygiene habit with the aid from an effective germ protection soap but most peoples are concern whether using germ protection will affect their skin. Lifebuoy-Shield 10 offers protection that is mild on skin and prevents re-entry of germs and decreases episodes of bacteria build up thereby providing a complete protection. Tested and proven to reduce the levels of various spreading germs, the Lifebuoy Clini-Shield 10 significantly reduces more germs on skin immediately after washing. It also provides moisturisation on skin, making it the perfect combination of cleanse and care. My Little Angel, CW show the correct method to watch your hand with Lifebuoy's New Clini-Shield 10 soap. Unilever Chairman of Malaysia, SIngapore, Myanmar, Cambodia & Laos, Rakesh Mohan said, "Uniliver Scientists at the Bangalore Research Centre have tapped into the endless resources of nature to deliver 10 times germ protection. Our scientists have identified naturally occuring subtances in the sap of pine trees and thyme leaves that help reduce germs more effectively, ensuring better germs protection and moisturisation on skin with Lifebuoy Clini-Shield 10. Our latest product for Lifebuoy was formulated to address the growing concern of mothers who want a better germ protection solution for their family. Lifebuoy Clini-Shield 10 is that perfect solution for mothers who want a superior product". Germs are evolving and increasing the risk of spreading faster and more often. It is crucial to take necessary measures to ensure that your family is healthy and germ free. Germ protection through personal hygiene is the first like of defence when it comes to dealing with any types of germs. By having good personal hygiene and habits, we can reduce or even eliminate the entry point of where germs become dangerous and pose as threat to our health. Lifebuoy Clini-Shield 10 is available as a bar soap and body wash in two different variants i.e. Lifebuoy Clini-Shield 10 Complete with Activ Natural Shield gives 10x germ protection and more skin care for full body protection and Lifebuoy Clini-Shield 10 Fresh with Activ Natural Shield gives 10x germ protection and more skin care with an uplifting green-nature freshness for full body protection. Now my eldest son, WH will show you on how he used Lifebuoy Clini-Shield 10 shower gel to take bath with. For more information and details, please visit their website at www.unilever.com or facebook at https://www.facebook.com/LifebuoyMalaysia/?fref=ts. Mike, afraid too mild for you. Later unable to kill all the germs. Your son lookalike model and advertise the product, so cute! So cute! Ya, now very important to keep germs away cos there is so many weird diseases out there. Better be safe. wow looks nice to use, long time no buy this brand. Shall check this brand soon. Sherry, you should for protection for our kids. Good to educate your kids on this since young :) and they look so cute in pictures by the way! hahaha..this is my choice at home! I always buy this brand. Cindy, great to hear that. Aww, Youre such a good mummy to educate your kinds on how to wash their hands properly. Great tips. I use Lifebuoy too. My skin can't use Dettol... So this is my choice. Sin Yee, great to hear that. Miera, my children love it too. I've seen this brand in the market for some time but I've never bought their products to try! Michelle, maybe you can try it now and feel it yourself. Sharon, a great protection for all of us. Stay Clean and healthy with Lifebuoys. Smell nice the shower gel. Betty, good that you like it too. good hygiene is of utmost importance, especially for children..
i am using the product now. Pamela, great to hear that. I prefer to use the foam rather than using the soap. It is more hygienic. Isn't it? For wash hand can use soap but for bath, gel one can create more bubbles. Children hv to stay clean. Otherwise will get allergic easily. Thanks for intro this useful product to us. Nice range for the whole family. Good tips sharing here, thank you.